Is having a roof enough to feel at home in the EU of 2012? 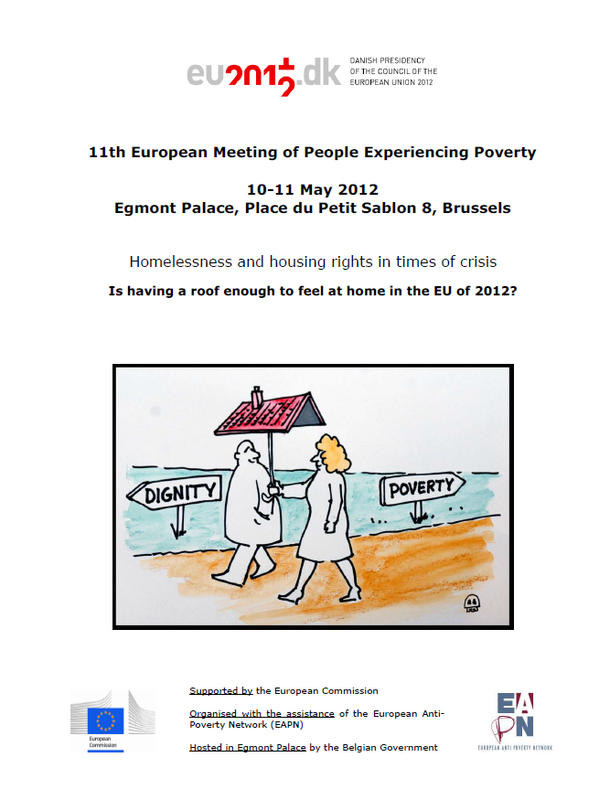 On 10-11 May 2012 the 11th European Meeting of People Experiencing Poverty addressed the question of Homelessness and Housing Rights in the Context of the Crisis. The meeting brought together over 150 people with personal experience of poverty and homelessness from 30 European countries. The Meeting was an occasion for an exchange of views and experiences on how toensure that people experiencing poverty can have access to adequate, affordable and energy efficient housing and accommodation. On behalf of the Danish Presidency of the Council of the European Union, Deputy Permanent Secretary for Social Affairs and Integration, Jesper Brask Fischer, opened the 11th European Meeting of People Experiencing Poverty. Mr Fischer stated that during the current economic crisis, the most vulnerable groups in our societies face some of the toughest consequences. The Danish Presidency therefore welcomed the opportunity to have a debate on homelessness and housing rights with people experiencing poverty or homelessness. Only homeless people know how it feels to be homeless – or what kind of help homeless people need. They are the experts on their own lives. We have an EU2020 target to fight poverty that we collectively need to comply with. The European reality is increasingly diverse and divided. There are even parts where performance on employment and social protection has been improving. But also because of demographic trends, economic growth will not return as in the past. We have a deficit of solidarity and we need to restore it at the European level. As concerns combating homelessness, what we do is identifying the causes, recognise best practices and spread innovative approaches like the Housing First. For the future financial period of 2012-2020, the Commission has proposed that at least 20% of the total European Social Fund financing in each Member State should be allocated for social inclusion. In terms of field of intervention, it is housing, healthcare, human rights aspects, taking action against criminalization of homelessness in the Member States. Homelessness is also addressed through other anti-poverty initiatives such as the Roma integration framework or the upcoming Recommendation on child poverty. On behalf of the delegations of people experiencing poverty, Sabrina Emilio, from the Italian delegation gave a strong message “that it is time that the EU leaders follow up their fine words about fighting poverty with concrete actions”. 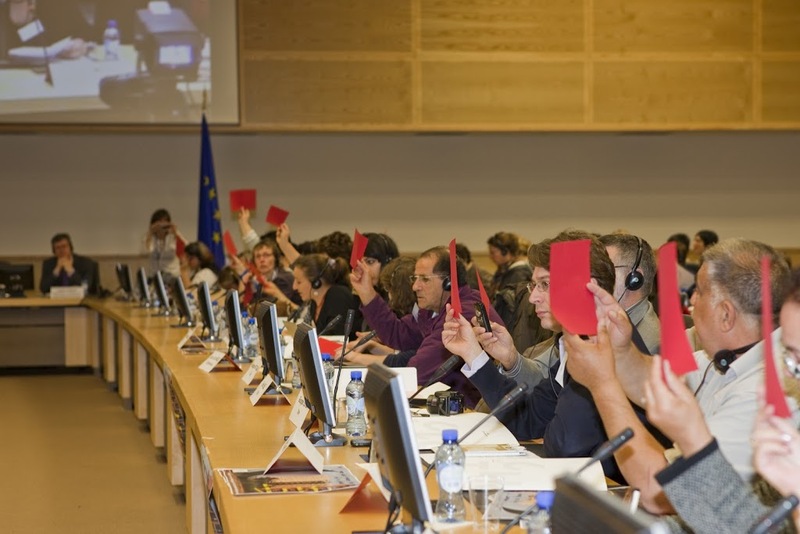 To reinforce this message the delegations showed a red card to the representatives of the EU Institutions to say that they have had enough of the measures to combat the economic crisis that are only creating more poverty and social exclusion. Ms Emilio concluded by saying “that the future of Europe depends on the EU leaders hearing this message and developing a real EU Inclusion Strategy that has meaningful actions at local, national and European levels ensuring access to housing and the financial means to live a dignified life for all Europeans”. In relation to homelessness and housing rights what are the key differences that can be seen in 2012 as compared to 2008? From the experience of the delegates and the preparation work for the meeting what are the ‘good and bad practices’ in relation to addressing homelessness and housing rights that have been identified? How can policies be designed to best address homelessness and housing in a way that is adapted to the different needs and realities of different individuals and communities and can ensure equality in access to homeless services and housing rights? The 11th European Meeting of People Experiencing Poverty was organised by the Danish Presidency of the Council of the European Union and The European Commission, with the assistance of the EAPN and FEANTSA and hosted in The Egmont Palace courtesy of the Belgian Government.